Those of us who work at the Library have front-row seats, so to speak, of the “Transformation of the Campus Landscape Initiative,” final phase. 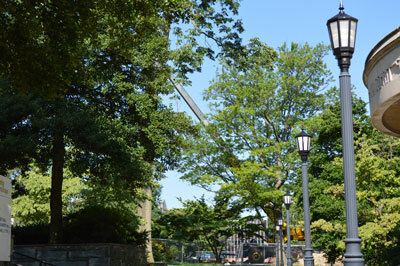 We’ve seen the decades-old campus drive and sidewalk removed, witnessed deep trenches dug for massive steam pipes maneuvered by a towering crane and observed the construction of a new platform and steps on Corr Hall’s west side with new walkways of brick pavers leading up to it. 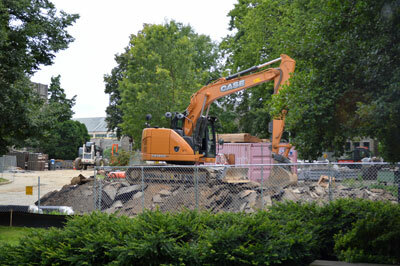 The words “Transformation of the Campus Landscape” seem inadequate for an operation of this magnitude. View from Falvey’s second floor stairwell. The large crane looks almost like a tree limb. You may recall that the underground work near the grotto Morro mentions involved replacing a steam pipe and installing “three large steam manholes at the west end of the new Grotto,” as explained in the “Overview of Phase III” video. That presentation also mentions “new underground storm water retention basin[s]” being installed between Sheehan and Bartley Halls and also at rear of the Connolly Center. The planning of this project, the logistics of deciding when and how each component needs to occur and the coordination of the various contractors seem overwhelming. Morrow and his team deserve credit for handling it all, as well as the unplanned but not unexpected problems that arise with such an undertaking. As if this wasn’t enough, Mendel Field next door to us is being re-graded and turfed this month so the library has roughly 180 degrees of muddy views. On the other hand, we will soon be half-surrounded by beautiful new landscapes.